Versatile trimmer cuts cardstock, artist black core mat board, 1/8” foam board and plastic sheets. Spare cutting mat, straight blade and perforating blade included. Adjustable magnetic paper guide hold materials on a calibrated sturdy metal base board. 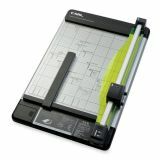 CARL Heavy-Duty Rotary 15" Paper Cutter - Heavy-duty rotary trimmer is designed for the most demanding trimming projects and made with a high percentage of recycled ABS plastic. Patented, locking rail mechanism and luminous paper holder are made of light harvesting acrylic. Use rotary trimmer to trim up to 36 sheets of standard copy paper. Trimmer also cuts cardstock, artist black-core matboard, 1/8 foam board and plastic sheets. Handy storage compartment holds extra blades and cutting mats. 15" trimmer also includes handy built-in paper guide, carrying handle, spare cutting mat, and straight and perforating blades." Features handy storage compartment for extra blades and cutting mats.